Donel Kinnard was born on April 5, 1936, in Logan, West Virginia. He enlisted in the U.S. Navy on July 28, 1954, and completed basic training in September 1954. Petty Officer Kinnard attended Hospital Corpsman training at NTC Bainbridge, Maryland, from September 1954 to June 1955, and then served as a Hospital Corpsman at the U.S. Naval Hospital at Corpus Christi, Texas, from June 1955 to July 1957. He then attended Field Medical Service School at Camp Pendleton, California, from July 1957 to May 1958, followed by service with Headquarters Company, 7th Communication Battalion of the 1st Marine Division at Camp Pendleton from May 1958 to May 1959. His next assignment was with 3rd Battalion, 5th Marine Regiment of the 1st Marine Division at Camp Pendleton from May 1959 to January 1960, and then with Medical Battalion of the 1st Marine Division from January to November 1960. Petty Officer Kinnard served at the U.S. Naval Hospital at San Diego, California, from November 1960 to November 1961, followed by service at the Puget Sound Naval Shipyard at Bremerton, Washington, from November 1961 to November 1963. He returned to the Naval Hospital at San Diego from November 1963 to May 1964, and then served aboard the destroyer USS Buck (DD-761) from May 1964 to May 1965. His next assignment was aboard the destroyer USS Duncan (DD-874) from May 1965 to January 1968, and then at Naval Station Norfolk, Virginia, from January to May 1968. 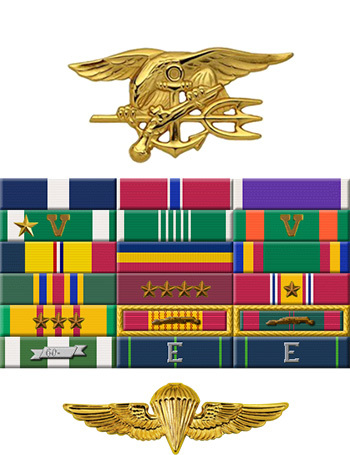 Chief Petty Officer Kinnard served at the Naval Support Activity in DaNang, South Vietnam, from May 1968 to January 1969, followed by service aboard the high speed transport USS Diachenko (APD-123) from January to July 1969. 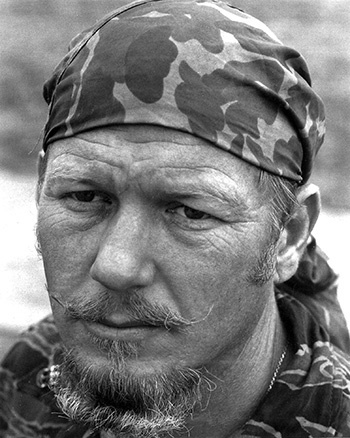 He attended SEAL Introduction training, Underwater Swimmer School, and Basic Airborne training from July 1969 to January 1970, and then served with Underwater Demolition Team TWELVE (UDT-12) at Naval Amphibious Base Coronado, California, and deployed to Southeast Asia, from January 1970 to January 1971. His next assignment was with UDT-13 at NAB Coronado and deployed to Southeast Asia from January to September 1971, and then with UDT-11 at NAB Coronado from September 1971 to November 1973. His final active duty assignment was at the Naval Hospital at Portsmouth, Virginia, where he served from November 1973 until he left active duty and joined the U.S. Navy Reserve on July 28, 1974. Senior Chief Kinnard retired from the Navy Reserve on March 1, 1979. He died on February 14, 2009, and was buried at the Donel C. Kinnard Memorial State Veterans Cemetery in Institute, West Virginia. For extraordinary heroism while engaged in armed conflict against enemy forces in the Republic of Vietnam on 20-21 January 1970. During this period, Chief Petty Officer Kinnard was serving with Underwater Demolition Team TWELVE, Detachment Golf, and operated with the Second Battalion, Fifth Mobile Forces Command during a sweep and clear mission in the Ca Mau peninsula. On one occasion, Chief Petty Officer Kinnard was singled out as a target by an enemy force while he was attempting to beach a damaged sampan from which three of the enemy had leaped into the water and escaped. His courageous action resulted in the capture of the sampan and enemy weapons. On another occasion, when his unit was subjected to intense enemy rocket, machine-gun and automatic-weapons fire, Chief Petty Officer Kinnard was wounded in the arms and legs by shrapnel from an enemy hand grenade. He immediately hurled several hand grenades across a canal into enemy positions. During the ensuing battle, he was suddenly attacked by one of the enemy who had crept up behind him. After several minutes of a fierce hand-to-hand struggle, Chief Petty Officer Kinnard succeeded in overcoming his attacker who was later identified as a North Vietnamese Army Lieutenant. By his personal courage and inspiring devotion to duty, Chief Petty Officer Kinnard contributed materially to the success of a vital mission and upheld the highest traditions of the United States Naval Service.